With Frank Martin heading to South Carolina, Kansas State Athletic Director John Currie has to make a hire to keep the K-State basketball program moving in the right direction. According to Currie, the coaching search is already underway. Here are a few likely candidates to replace Frank Martin as Head Coach of Kansas State University. A former basketball player at KU, Boyle is familiar with the Big 12 and Kansas landscape. Boyle has spent the last two seasons as the Head Coach at Colorado, leading the Buffs to the Round of 32 in the NCAA tournament this past year after winning the PAC 12 postseason tournament. Boyle will make a little north of $600,000 this coming year at Colorado, incentives included. Kansas State could make a very lucrative offer that would very possibly triple that. Most feel that Boyle is waiting for the KU job to open. But seeing that Bill Self may be at KU for a long time, Boyle may be intrigued if K-State offers. This would be a great hire if Currie could pull it off. A former player at K-State under Jack Hartman, Underwood is a K-State guy. Brad has spent the last 5 seasons as an assistant under Frank Martin. Many feel that Underwood would keep the current team together. However, the lack of head coaching experience may keep Underwood from getting the job. The former Mr. Basketball in Indiana and possibly the best player of the Bob Knight era at IU has built a very good program together at New Mexico after failing at Iowa. Alford is a good X’s and O’s coach who has played the game before. The one drawback is that he has somewhat of the same antics that Frank Martin had during his tenure at K-State. That could hold John Currie back. Another former K-State star, the McPherson native has spent the past decade or so as an assistant under Lon Kruger. According to Rob Cassidy of gopowercat.com, Henson has already reached out to John Currie to express interest in the job. Earlier today, Henson said, “K-State is a dream job for me, it’s home. It’s my alma mater. There are so many ties and connections. It’s a great place, a great town, a great university. I’d love a shot at it for so many reasons.” As with Underwood, Henson’s lack of head coaching experience may be a drawback. My Take: I think that a $25 million practice facility being built makes Kansas State a much more lucrative job than it was 6 years ago when Bob Huggins was hired. Money will not be an issue here, Kansas State has plenty of money to spend on a coach. I think the first option should be Boyle. If they can’t get him, move on and find the right candidate. John Currie cannot mess this up. If he does and Kansas State goes back to the mediocre days of the late 90’s and early 2000’s, then he may be looking for a new job. 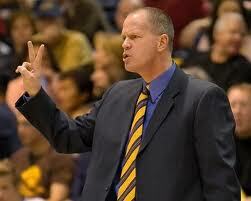 Prediction: I think Kansas State will offer Tad Boyle a contact he can’t refuse and name Boyle as its next head coach. This entry was posted in Basketball, Basketball, Home, Midwest, National and tagged Frank Martin, Kansas State Basketball, Tad Boyle. Well i sure hope he doesn’t think Bruce Pearl is his savior. Why on earth would Boyle leave Colorado for K-State? Look, I love Manhattan, but it’s not a major upgrade from Boulder if any at all. Colorado can offer as much or more than K-State can. Do you think it’s easier to recruit to Manhattan or Boulder? I mean really, Boyle is a great suggestion, I guess, but it seems like some kind of nutty pipe dream that isn’t based on reality. Hey, if you’re going to include Boyle, you might as well thrown Phil Jackson on the list too. I mean that practice facility is going to be pretty sweet and all. According to numerous reports from everyone is Kansas City, we are correct his name has come up the most in talks about who is the most likely hire. Also, Kansas State can offer more money. Plus they have nicer facilities and for recruiting, Frank Martin was able to land three 5-Star recruits to Manhattan. The Cats do not offer down hill skiing, but they do offer a tradition and a stronger conference, better players choose wisely. This would be a perfect fit for Broyle or Henson. It’s funny how often KSU people keep saying that Tad Boyle made 600K incentives included. Nope. He made that much incentives NOT included. Over 1 million incentives included.